During my travels cooking I have been lucky enough to work with some fantastic Thai chefs both when in Malaysia and when working for a Thai resort in the Maldives. 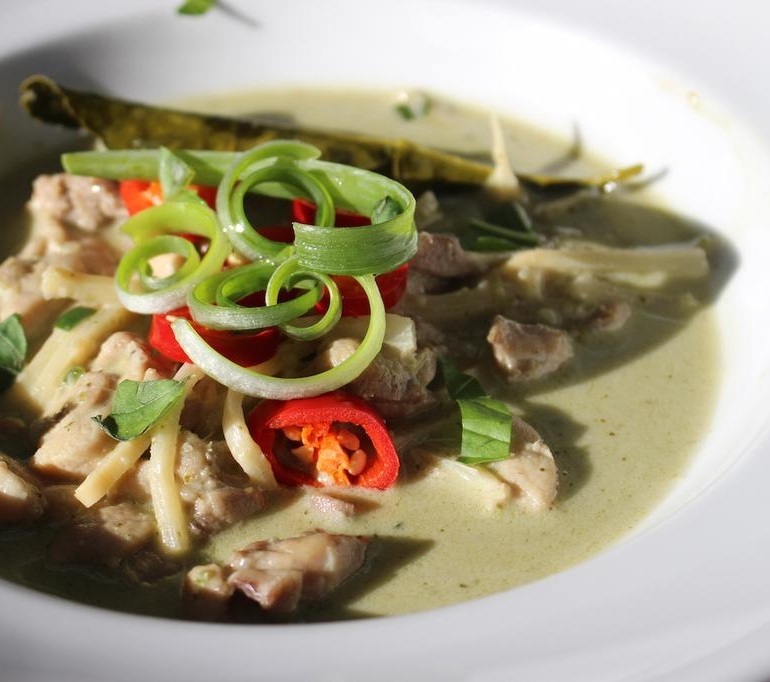 To me Thai cuisine is all about punchy vibrant flavours, which I love. You’ve got to have the right balance between salty (fish sauce), sour (lime juice), spicy (a good kick of chili) and sweet (sugar) to make sure you get an authentic taste, and if you’re not sure what that authentic taste is then what better excuse than to book a flight to Thailand! Roughly chop and blend all the ingredients together in a blender or food processor until well combined. Simmer 1 cup of coconut cream and curry paste over moderate heat, stirring until it becomes fragrant and the oil starts to separate from the coconut cream. Add the Chicken and cook over a moderate heat, stirring frequently until the chicken changes colour. Add the remaining coconut cream and sufficient water to cover the chicken. Add Lime Leaves and Bamboo Shoots. Bring to the boil (stirring), reduce heat and simmer until the chicken is tender. Stir in the fish sauce, sugar, green chilli and basil. Transfer to a serving bowl and scatter with the fresh Basil and Chilli slices.